Pro-Change offers coaching versions of our online LifeStyle Management Suite of behavior change programs. Health coaches and counselors can use our tools for telephone and in-person administration of evidence-based TTM behavior change guidance. Coaching programs are available for exercise, healthy eating, smoking cessation, stress management, weight management, medication adherence, and responsible drinking. Following a coaching session, clients are directed to an online portal that provides access to a Personal Report of all the feedback the client received during the session and to a Personal Activity Center (PAC). The PAC has additional information and activities designed to reinforce key stage-matched principles and processes of change and support progress between intervention sessions. 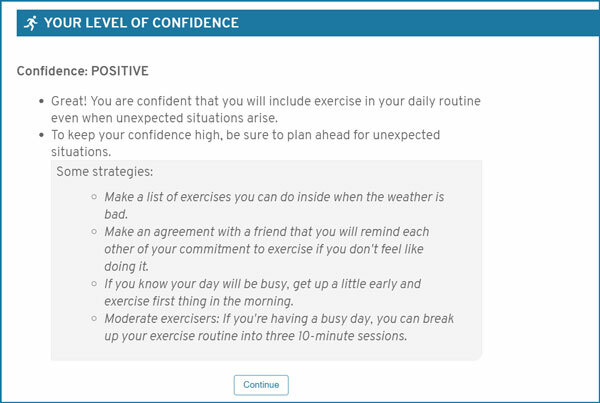 Clients can complete follow-up intervention sessions with their coach, or on their own via a patient-facing computer-tailored intervention accessed via their PAC. All sessions are tracked in the same database so coaches can track client use of the program and their change over time. 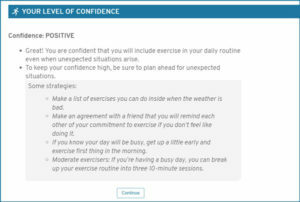 Sample exercise feedback screen for telephone-based coach to use with a client.